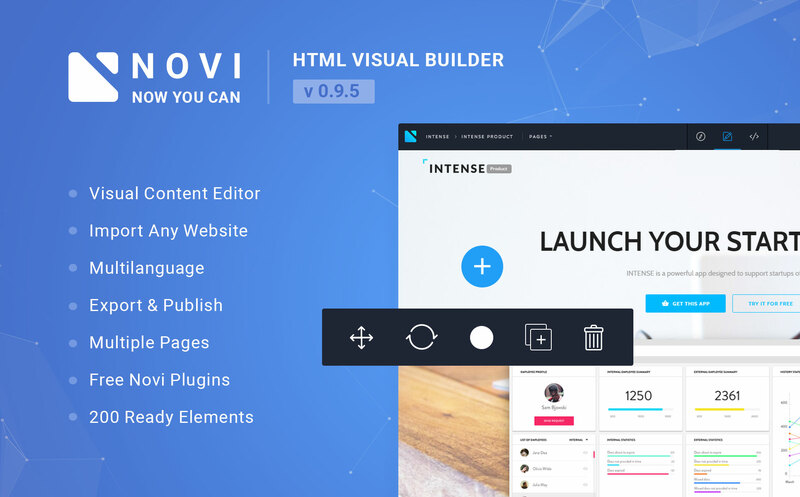 InstallationYou can install Novi Builder on a local or remote server. See the documentation for details. - There was added a new SEO Section in Project Settings. Now you have the ability to generate sitemap.xml and robots.txt files. - A few issues of importing project media files into Media Library were fixed. - There was fixed an issue with uploading icon packs on *nix based systems. - Added the feature of image reduction in Media Library. - Added the feature of copying an image link (relative path) in Media Library. - Added the feature of adding images to Media Library using drag & drop. - Added the feature of editing letter spacing and font weight in Text Editor. - Added the feature of saving the original image when cropping or reducing an image. - Added the feature of importing all template images to Media Library. - Added the feature of deleting an image from template if it already is in Media Library. - Improved the application's startup speed. - Improved the speed of switching to Preview Mode. - Fixed the calculation of text editor position when viewing the website in mobile version. - Changes in text editor are now applied to the resolution, in which the user carried out his actions. - Updated UX in Media Library. - Reworked the features of changing the font size and family. - Reworked the Text Editor logic. Now all changes are saved in the novi.css stylesheet. - Reworked the appearance of settings. - Reworked the tool for editing links in text editor. Now it works similar to the Novi Link plugin. - Reworked project's work logic with Google Fonts. Added a corresponding entry in the settings. - System and project settings were combined. - Fixed the error with the unavailability of adding presets in Edit mode. - Added Style Manager in HTML Code Editor. - Added German and French localization. - Added the feature of editing local CSS files connected via @import. - Added the link to changelog in the window with new updates. - Added “Styles directory path” field in Project Settings. - Added the manual forcing element states (hover, focus, active) in Design Mode. - Updated the link plugin. Added the feature of setting favorite links. Added the feature of creating a page link. - Updated the image cropping tool. Added fields for manual input of cropped area’s size. Added automatic recognition of an optimal size for a cropped area based on the replaceable image’s size. - Updated preset insertion window in Edit Mode. - Updated the carousel plugin. Added the feature of changing and moving carousel elements. - Fixed incorrect calculation of the validation error position in a CSS file. - Fixed a bug with displaying categories in preset settings if a name contains spaces. - Fixed a bug when editing text in the inserted preset was not transferred to the code.